This adorable box that shows a scene from Lewis Carroll's popular tale Alice in Wonderland has been drawn by the talented Fedoskino artist, Oleg Golovcheonkov. 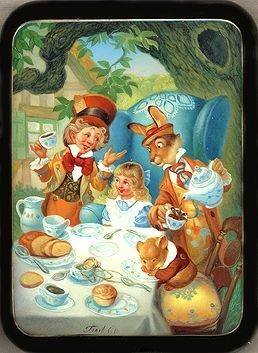 Here we can see a recognizable moment of the story when Alice becomes a guest at a mad tea party. She drinks tea with the Hatter, the March Hare, and the Dormouse, and listens to their stories. The scene is painted in bright oil paints, and filled with a lot of brilliantly drawn details. Each character is easily recognizable, and has his own individual look. The scene is framed with a gold line; the box's sides are decorated with two parallel gold lines. The box is constructed from paper-mache. Black lacquer is used to paint the exterior of the box while red lacquer completes the interior of the work. A hinge is fastened to the left of the composition, and the box rests on a flat bottom. The work is signed with the artist's name.